How I love my wife, what else can I say. And the way my wife sounds... so sweet. Only this time, the wife was actually WIFE, a country station in Connersville, Indiana, simulcasting on AM with call letters WCNB. However, it's not the great country music, not even the fact that this "Hitkicker 100" was coming all the way from Indiana, but its amazingly low transmitter power that gave me the most kicks. I had picked up a station with mere 4.6 watts of power - at a distance of 6742 kilometers (4189 miles). Sunset in the United States is the time to catch real rarities from there. Of course for daytimers, sunset - or very rarely also sunrise - is the only possible time to pick them up in Finland, but even for other stations dusk and dawn are the moments to watch for. Unfortunately, only very seldom are the propagation conditions favorable already this early in the evening. January 16th 1995 was one of those exceptional evenings. At the time, it didn't look like much of a success. Only a couple of the most common North American stations were audible before 2300 UTC. On this LEM83 DXpedition to Lemmenjoki I had kept a close watch for stations on 1570 and 1580 kHz, and once again I had a feeling that something might emerge on 1580. There was no audio, but somehow it sounded promising, so I left the recording on, and was away for a few minutes - perhaps scanning the fridge instead of the dial, I don't remember anymore. When I returned to catch the top of the hour station identifications, nothing was heard on 1580 nor on any other interesting frequency. So much for it, I thought, but decided to keep the recording and check it later, because it is very typical for stations to pop up for a short moment at sunset. Later I identified stations like WSPD (1370), WGVU (1480) and WENE (1430) along with some Venezuelan stations. It was only later back at home when I was listening through my tapes, when I found out that I had caught less than a minute of audio on 1580 kHz. 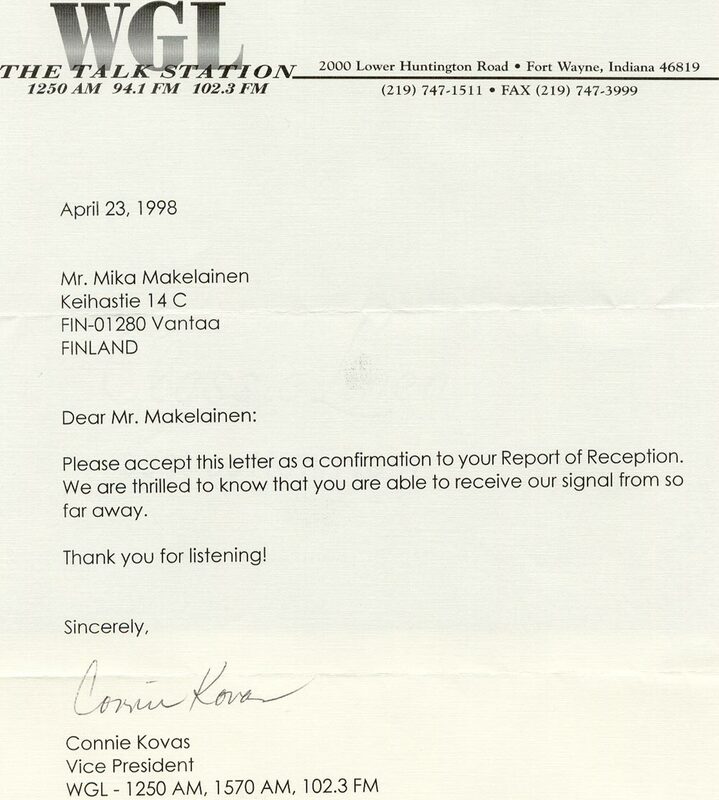 There was a station identification "... WIFE AM 1580 WCNB Connersville-Richmond", followed by a spot or sponsor's announcement: "... brought to you by the Whitewater Valley ... Pavilion". The signal was relatively clear, but faded away immediately after this. A brief visit indeed, but for once, what a timing with the station identification! The calls didn't ring any bell, but I did recognize Whitewater Valley. There are probably several in the U.S., but I remembered canoeing in what was called Little Whitewater River in Indiana, close to the Ohio border, 15 years earlier - at the age of 15. 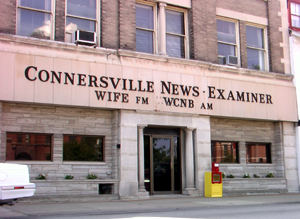 I searched for stations in the area and found WIFE Connersville, Indiana, listed on 1580 kHz. Connersville is located in an area called the Whitewater Valley, not surprisingly at the Whitewater River in Fayette County, Eastern Indiana - not too far from the tributary where I paddled for the first time. Believing my eyes more than my ears, I logged the station first as WIFE, but later I found out that three months earlier the FM and AM calls had been swapped in connection with a reshape of the format. The bigger surprise was however yet to come. The listed transmitter powers were suspiciously low (250 watts daytime, 5 watts nighttime), and I was hoping that the station would explain if this really was the situation. 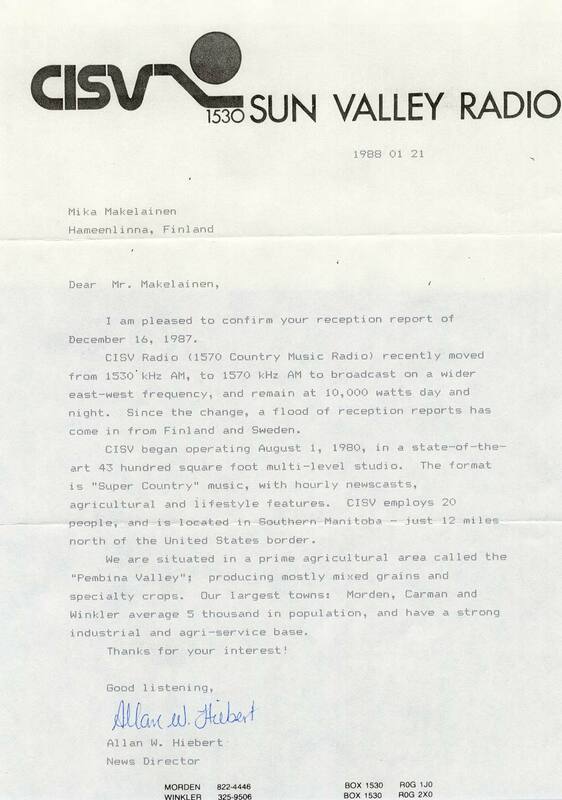 On a May afternoon I received a confirmation of reception from WIFE-WCNB Chief Engineer Mike Peacock. 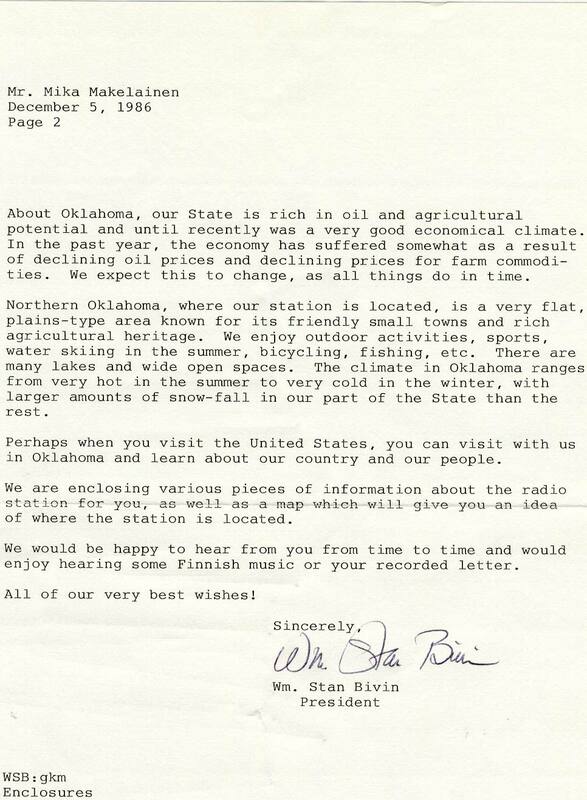 And not just any confirmation, but a nice letter along with a long, fun and very informative recorded letter (16-minute MP3) followed by a recording of their broadcast - and a t-shirt of the station! The station went on the air in 1948 as The Friendly Voice of the Whitewater Valley - WCNB. 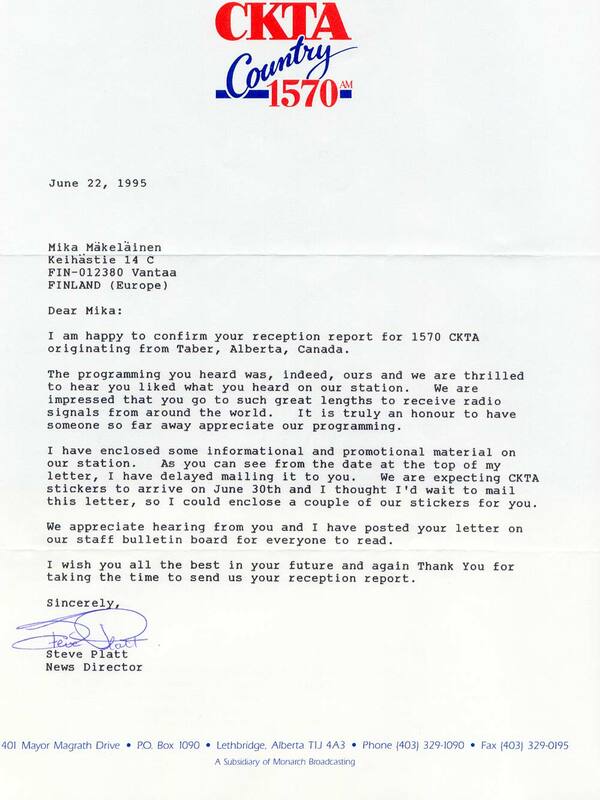 Around 1980 they applied the call letters WIFE for the AM station after another station in Indianapolis with those calls had gone out of business. - We applied the WIFE call letters simply because they're clever, the word wife. We have a lot of fun with slogans that we run, says Chief Engineer Mike Peacock in his recorded message. 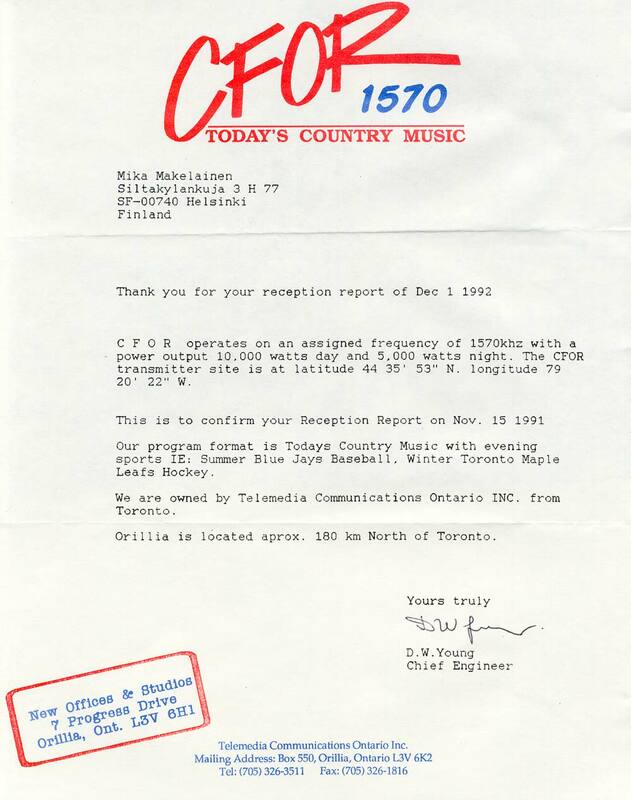 The FCC assigned the calls, and the AM station remained WIFE until 1994. Thereafter the calls have been used on 100.3 MHz, a 30.000-watt 24-hour station, identifying as The New Wife FM, Hot country and then some, Hitkicker 100. Peacock explained in detail the FCC system of allocating licenses with different transmitter powers. The AM used to be a daytime-only station until late 1980's. Thanks to WCNB's present post-sunset authority, I was able to pick them up even after sunset. I heard the station at 2253-2254 UTC. As it was the middle of the month, the sunset (which I estimated was at about 2246 UTC or 5:46 p.m. Eastern time) coincided with the time the station was forced to drop power. - When you picked us up, we were on our nighttime reduced power. Because you picked us up at 5:53 p.m. Eastern time, that means that would have been about 8 minutes after we reduced our power at 5:45 p.m. At night we reduce the power to - I hope you're sitting down, you won't believe this - at night we reduce our power to 4.6 watts. You picked our station up, on your DX-expedition, and we were only running 4.6 watts of power. Isn't that amazing!, Peacock explained enthusiastically. Peacock should know about transmitting powers - he is not only an experienced chief engineer but a ham operator and a shortwave listener! This was the first time - and to my knowledge the only time - that WCNB has been heard in Europe. And as far as I know, 4.6 watts is the lowest power for an American station ever heard across the Atlantic in Europe. However, a 1-watt signal from the U.K. has been heard in Newfoundland, at a distance which is about half of that between Indiana and Lapland. It is hard to beat the power of WCNB, but many other stations come close to such lows. In Northern Europe there are basically two options if you're aiming at stations with the lowest possible power - which many DXers do. One is to hunt the Canadian CBC relays, some of which are 40-watt stations. I have managed to get two with regional programming, CBSI4 Labrador City NF (1240 kHz) and CBKC Fort Vermillion AB (1460 kHz). The other option is to stay put on 1570 or 1580 kHz. There are of course low-power stations also on local and regional channels, but 1570 and especially 1580 are safer bets. 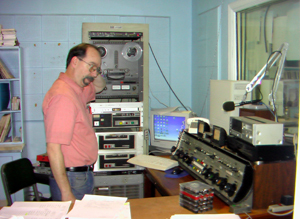 1570 opened out years ago after CKLM vacated the frequency, and luckily CBJ on 1580 is also moving to FM. Most of the remaining stations on both channels nowadays have licenses giving unlimited time operation, but with a very restricted nighttime power - precisely what makes these channels very interesting. As an example of what can be heard - here in Northern Europe - the following tables demonstrate what I have netted on 1570 and 1580 kHz during my 22 years of DXing. Call letters and powers reflect situation at the time of listening. Clicking the QSL link will let you view some of the verifications I have received - a word of warning, the files are large. 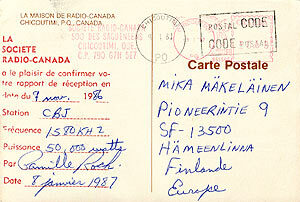 In Lapland, the frequency of 1570 kHz is dominated by the Canadian CKMW Winkler MB and the Mexican XERF, which I believe is not the case in much of Western Europe. Therefore in Western Europe 1570 should be a more rewarding frequency than in Finland - provided that you can mount a long beverage antenna, a prerequisite for catching the real treats of the frequency. KOKB - This one I picked up on my first DXpedition to Lapland, broadcasting a football game hosted by Steve Taylor, from a local high-school. At nighttime they use variable power levels, 50 watts on my lucky night. 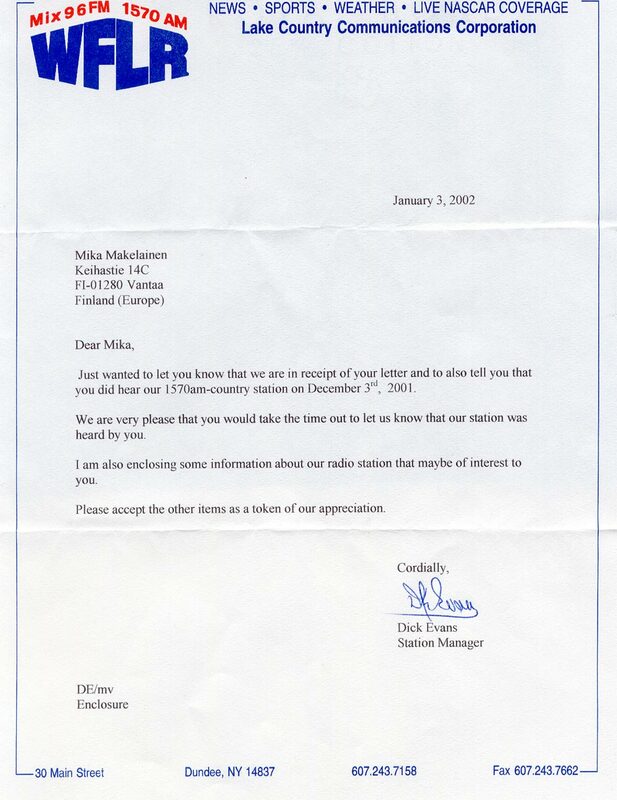 It was the first time KOKB was heard in Europe, so the reply by Station Manager William Stan Bivin was overwhelmingly generous. 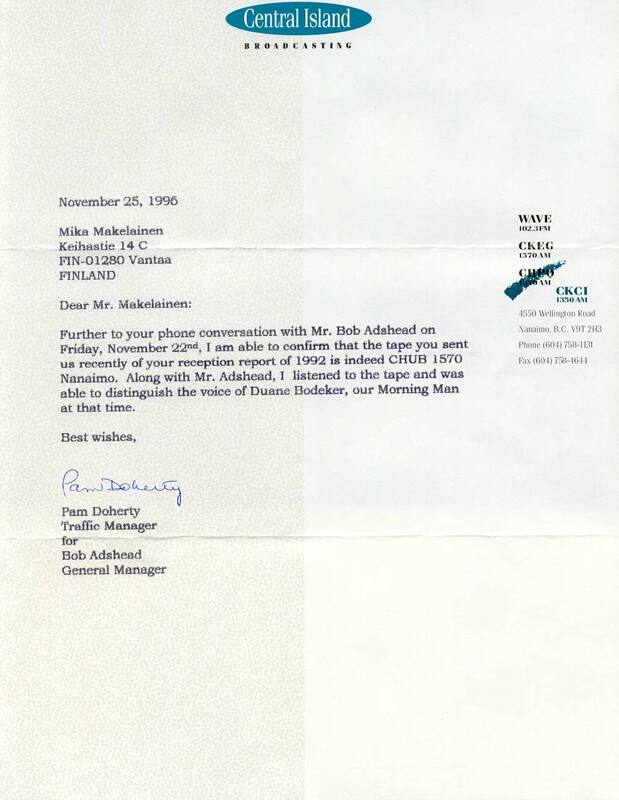 He even had the entire staff record me a personal Christmas message on a cassette (now a 4-minute MP3)! 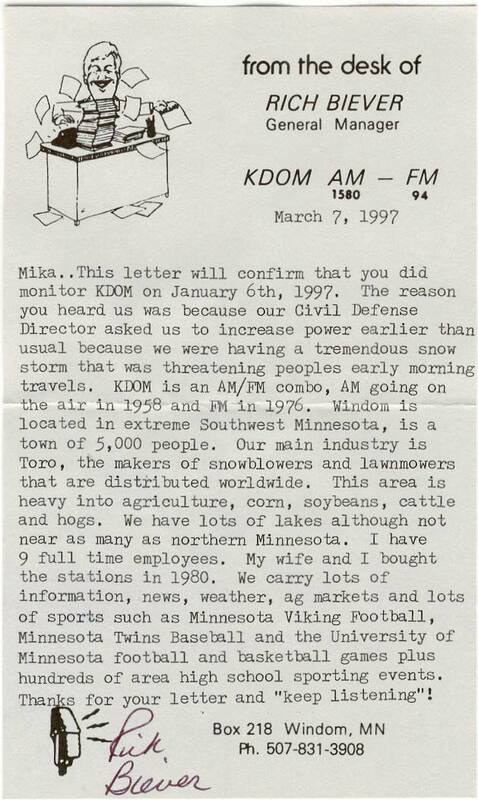 KNIM - Heard this one with oldies music and several identifications mentioning only their FM frequency of 97.1 MHz. President Steve Mickelson must have realized how cold it gets up here because he sent me a KNIM jacket and four coffee mugs! Well, he does have Norwegian heritage. 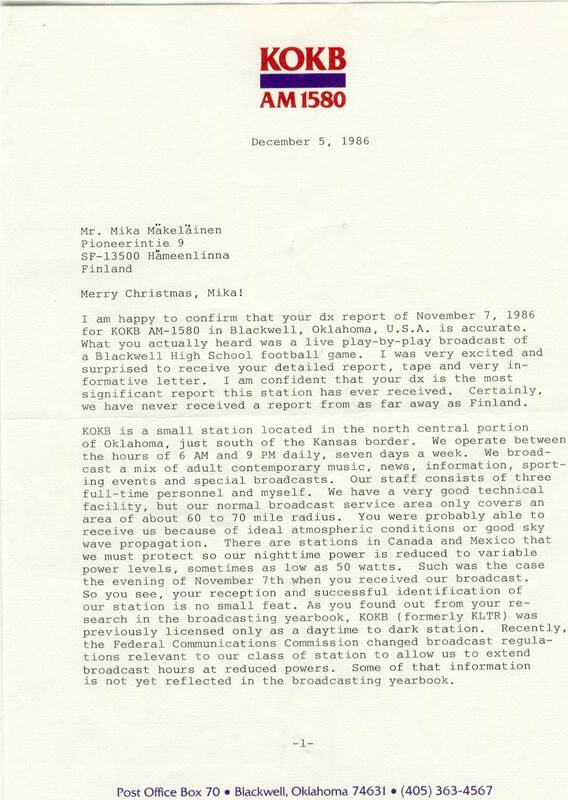 He didn't say anything about the transmitter power, so I have relied on information in the AM Radio Log, which gives a nighttime power of just 11 watts. KFQC - Finally got this one verified from the former director after about a dozen reports, faxes and phone calls to various addresses. The reason for this unusually persistent effort was their nighttime power of only 7 watts, which for me is second only to WCNB, as far as North American stations are concerned. 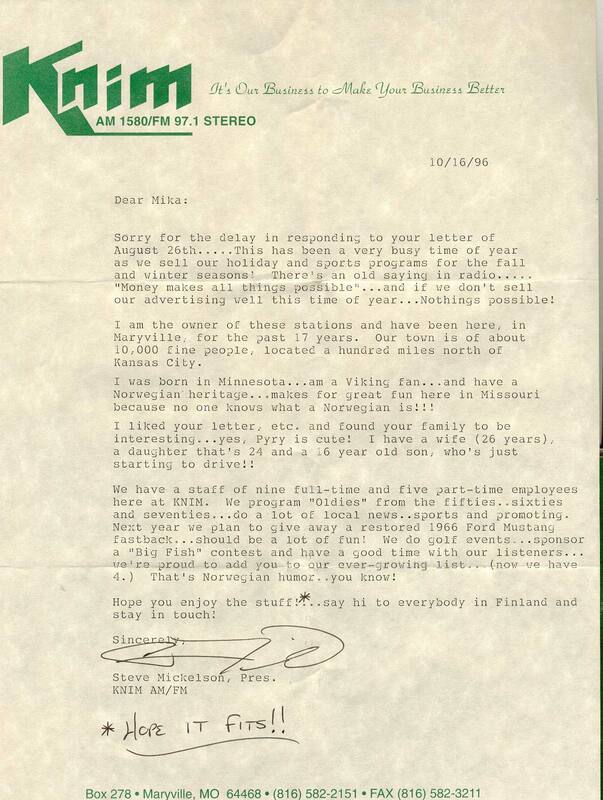 Unfortunately, the station has been off the air for the past couple of years. For me 1580 has been the most productive frequency in scoring low-power stations from North America. Unfortunately at the present stage of the solar cycle it is tough to hear anything on this frequency, let alone the low-power rarities. 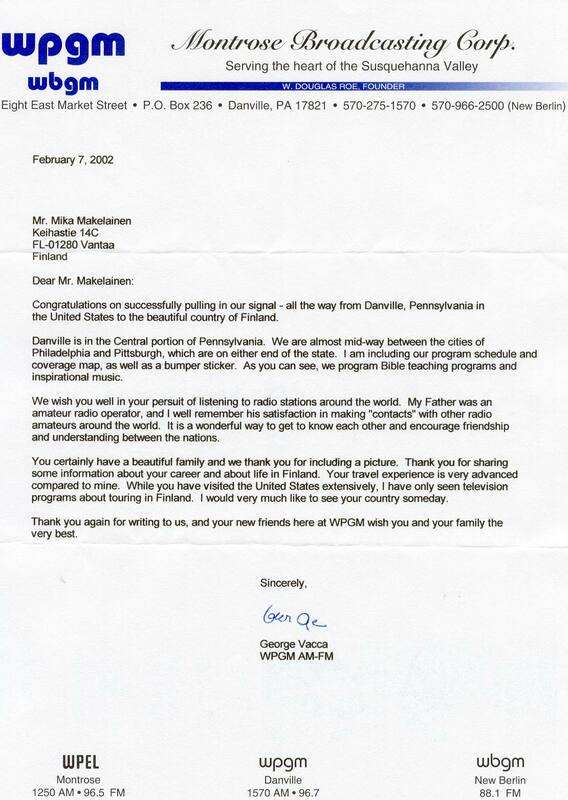 For example during the 1999-2000 season I didn't hear a single U.S. station on either 1570 or 1580 kHz.